The release of Star Wars: Battlefront this November just became even cooler with the announcement of the special Darth Vader PS4! 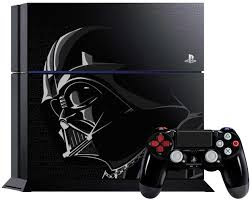 Sony announced at D23 today that the Darth Vader PS4 themes console will be released with Star Wars: Battlefront this November. The Darth Vader console will come in two different incredible bundle packages. The first bundle package will feature the deluxe version of Star Wars: Battlefront and the second bundle will feature the "Saga Starter Pack" of Disney Infinity 3.0 and a special version of Battlefront with exclusives such as Han's blaster! The Infinity started pack comes with both of the Infinity playsets for the prequel and original Star Wars, as well as a Boba Fett Infinity figure. The special edition bundles hit stores on November 17th! Don't miss out on these awesome bundle packs.